When something sounds too good to be true, it usually is. Latest case in point: using sand in your coop, run or chick brooder. Recently I've been watching several other bloggers praise the benefits of sand - how easy it is to keep clean, how much the chickens love it, etc. but I quickly discounted it because wild poultry don't choose to live at the beach. They're not seagulls after all! Just going with common sense and logical thinking, using sand in chicken keeping didn't make any sense to me. Not only that, one of the biggest proponents of sand seems to have had more than her fair share of sick and dead chickens since switching to sand, and so as more and more readers started asking my opinion on sand, trusting me to provide accurate, solid advice based on what's best for their chickens, I decided it was time to do some research. So I spoke with a long-time (30 years+) chicken keeper from a long line of chicken farmers, our vet (who not only treats but also raises chickens), and an herbalist who is also chicken keeper. I also read a few scientific studies and listened to a very informative podcast by Dr. Peter Brown on The Chicken Whisperer's show. It turns out that my initial instinct was correct. The REAL scoop on sand is - DON'T USE IT. While proponents of sand cite benefits such as 'it looks better', 'it's inexpensive' and 'it's easy', I don't consider ANY of those to be valid reasons to chose to use something with our animals or not. According to the reputable experts I consulted, using sand in the brooder can be very dangerous for young chicks (and in fact I have heard from one Facebook fan who lost a chick to impacted crop after brooding on sand). 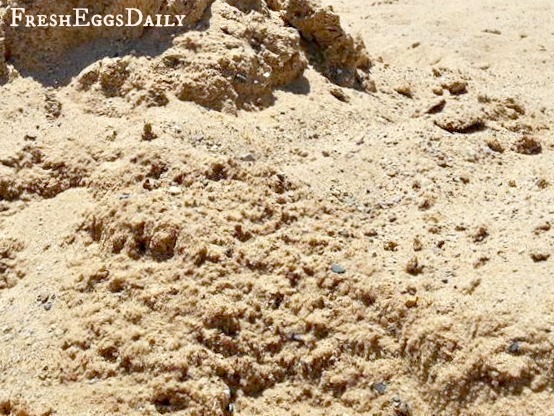 One expert said "Chicks can mistake the sand for feed and eat it. Though chicks need grit to help digest their food, sand gets sodden and can clump in the chick's crop unlike commercial grit or dirt. This can lead to complications causing suffocation, impacted crops and even death. Additionally, feces in the brooder becomes "breaded" with the sand and often chicks will eat it not recognizing it as feces. I agree it does make for easy cleaning, since you can use a kitty litter plastic scoop, but it is not a safe medium to use. Another point to consider, sand fosters the growth of e-coli bacteria much like water. " I read a study that said in part "Sand (silica) is very dusty and can lead to silicosis, a respiratory disease caused by repeated inhalation of fine particles, especially in younger hens." Let's face it, it's not a good idea to take any chances considering chicken's propensity to contract breathing issues due to their complicated respiratory systems. Not only that, just imagine how hot sand will get under a heat lamp for the poor little chick's feet. After all, do you want to have to stand on sand at the beach on a 95 degree day for very long? Another long-time chicken keeper said "Sand is known to harbor e.Coli and coccidiosis. The combination in a brooder of sand, feces and the warm, moist environment under a heat lamp is a disaster waiting to happen. It's the perfect climate for all types of bacteria and pathogens to grow very rapidly and sicken chicks." SAND IN YOUR RUN/COOP/BROODER? 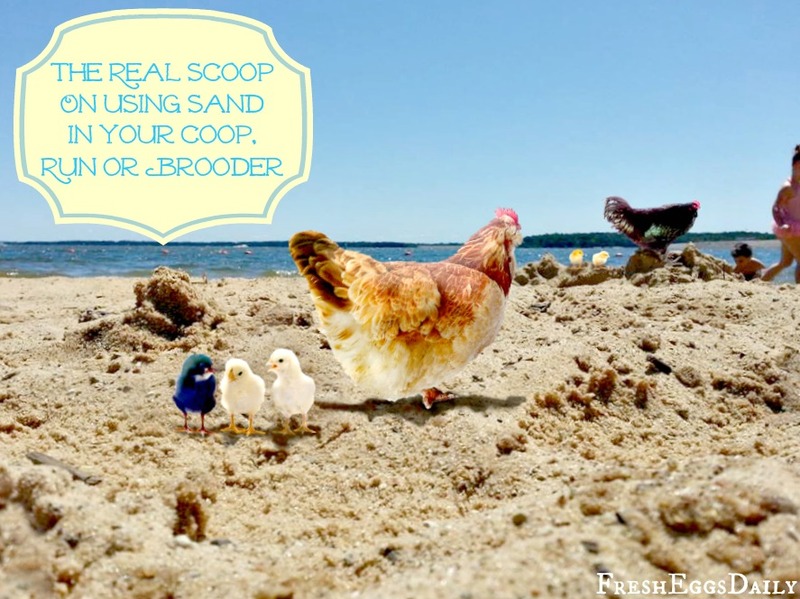 (click HERE to listen) Peter Brown, aka The Chicken Doctor just explained how having sand in your run may increase the chance of having a coccidiosis breakout!!! Great show today about managing litter, bedding, and runs to control coccidiosis! I learned from the podcast by Peter Brown hosted by The Chicken Whisperer this past June that sand seems to run the gamut as far as coccidiosis goes. In some cases, the pathogen will multiply out of control for the reasons stated above. In other cases, the sharp edges of the sand actually kill all the coccidia microbes, which can be just as bad since that prevents the chicks from being exposed to even small amounts, which they need in order to build an immunity. The Chicken Doctor actually recommends cleaning out a brooder less often (and using shavings preferably), allowing the natural bacteria and pathogens to be present so the baby chicks get small doses, reading them for the outside world where they will presumably have built a natural immunity to keep them protected. Either way, sand is not the way to go. A long time chicken keeper shared his thoughts with me that sand has NO insulating properties like straw or shavings, so in the winter will provide no help in keeping your coop warm, unlike straw which is a wonderful insulation material. Additionally, wet sand will freeze in the winter and be like hopping off the roost onto cement pavement - in fact we've heard from two readers who ended up with chickens with broken legs from doing just that. Sure, having a truckload of sand delivered and spread in your coop sounds great. It sounds pretty much maintenance-free, other than requiring a raking out from time to time of the area under the roost mostly. But sand retains all sorts of pathogens, and if you just periodically remove the visibly soiled portions, you're leaving a virtual breeding ground inside your coop that you can't see. When I change out the litter in our coop, I change it ALL out. Down to the floor boards. Sure, it's not my most favorite job, but it's necessary in my opinion for a healthy flock. Raising chickens isn't about what's easiest for US, but what's best for THEM. Another important consideration, unlike straw or shavings, sand doesn't compost. So when you eventually DO need to change it out, what do you do with it? I don't know about you, but I certainly don't want a toxic pile of E.coli-laden sand piling up in my backyard where children, cats or dogs could pick up all kinds of nasty stuff from playing in it! We use straw in our coop, which composts wonderfully. Since we use the Deep Litter Method throughout the winter, by spring we are left with a coop full of beautifully composted 'soil', most of which is ready for our spring garden. The rest of the year, the straw goes into our compost pile to finish decomposing until spring. You know what it's like walking barefoot on beach sand in the summer sun. Just think what hot sand feels like on chicken feet all summer in the run? I'm betting downright uncomfortable and unbearably HOT. Also, one important way that chickens cool off is to dig holes to get down into nice cool damp dirt....not happening if you use sand in your run. According to one expert, "[In the run] plain old dirt would be cooler than sand. Sand does not hold moisture and that can be preferable if you are looking for "dry". However a chicken scratches down into the dirt and can press their bodies against it to draw heat from their bodies [in the summer]." Then went on to say "I have tried probably every litter material there is (except sand because of my speculations). To be honest, I have never heard of anyone using it in all my years of poultry keeping. However, I do like to compost the litter and no way would I be piling sand on my gardens." Even more importantly, insects and earthworms don't live in sand. By covering your run in sand, you're depriving your flock the enjoyment of scratching for bugs, larvae and worms. Our chickens spend an inordinate part of their day scratching and cackling excitedly when they dig up a tasty treat. It keeps them busy and supplements their diet with a nutritious free source of protein. If your run is sand, you remove that from their daily routine. Additionally, in the run, similar to in the brooder, feces will get 'breaded' in the sand and possibly eaten. Sodden sand can also lead to impacted crops in grown hens as well as chicks. Free Feather: Sand is no good in cold climates. It might drain well, but it is really no fun to scratch in or find bugs. It is good for only in a box for dust bathing. It does not compost, and you cannot plant in it. It also has a tendency to stink and cause diseases like Coccidiosis. It just really is not natural. Cedar Crest Farm: I could not agree more with "Free Feather" in regards to sand in the coop. I switched all my coops to construction grade sand last year and ended up with several cases of Coccidiosis, sinus infection and mites. (Needless to say I switched back) The sand is still in my compost pile. This is a great blog post. I recently tried using sand in a small coop and found it to be annoying! Thanks for letting me know about risks associated with having sand. And annoying is probably the least of your worries, after researching as I did! 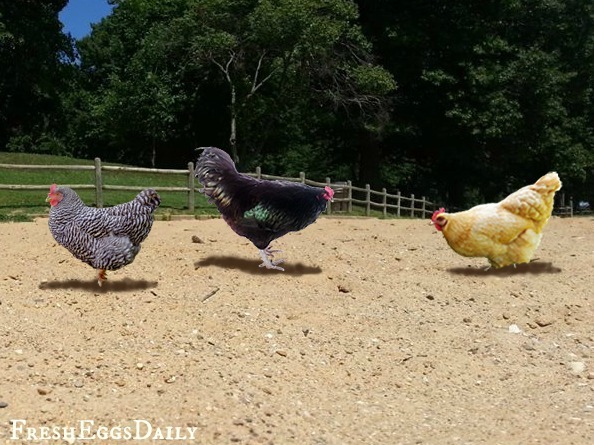 While I have never used, nor would have considered sand for my coop, my free range chickens do enjoy hanging out in the sandbox that my children have outgrown. There is shade over the box, so between that and the ease of burrowing down in the cool, sometimes moist sand is a perfect heat busting environment. Sure a small area of sand is fine - they probably enjoy a bath in it from time to time as well. I felt the same way that this is not where chickens would naturally live in. So glad that we at DaybyDay Homestead did not chose this option. So glad to hear. If only more people really did things naturally and thought more about what's best for their animals - not them necessarily. Thanks, Lisa, for the great information! I've been reading about the advantages of sand, but I've been thinking that sand "just didn't seem right", in my coop and run! I'm glad I procrastinated in getting some long enough for you to post this! Good for you. Go with your gut. I had thought about getting a bag of play sand for my girls to wallow in, but now I'm content to let them burrow into the dirt spots they are making. I do have a question though. I only let my girls out to forage when I can be out there with them. I would love to leave them out for a good part of the day, but am just afraid something might hurt them. The run area they have access to does not have overhead covering, but they would be able to run back into the coop if needed. Am I being to much of a worry wart? I just want what's best for the girls. I always take them treats from the garden when I sit with them, and they love to eat the grass! Just hate to deprive them of what I know makes them happy! Any advise? Oh, I do have a canopy set up for extra shade. We feel an enclosed run is safest and if it is large enough with shade, bushes, occasional treats, things to hop onto or perch on, they can be perfectly happy. Far better than taking a chance and letting a predator get them. They might have the instinct to head back to the coop. But its a chance you take. only you can judge if they will be safe being out while you're gone. Oh and with chickens there is NO such thing as being a worry wart! Bad stuff happens all the time if you're not careful. My girls are in a tractor coop. It's moved every fews. It it completely closed in. (top & bottom)We live in the country with many, many preditors. There would be no girls, if we let them out. So to provide them a dust bath place, I have to use a large tub with sand & DE. Otherwise, the are on grass all the time. They are about 16 weeks old 7 haven't noticed any problems yet. All they do is bath in it. I have to disagree 100% with this article. I live in Florida. Our "soil" is pretty sandy to begin with but just enough dirt mixed in to make it a nightmare when it rains. The soil we have does not drain at all, it is muddy as heck in the summer (we got 10" of rain this month already!!) and in the winter when we have no rain at all it dries out and creates the most horrible dust that just kicks up and coats everything. It is so difficult to breath. I tried just about everything in the run and finally when I couldn't breath anymore, and my chickens were weazing like crazy I got a truck load of sand and filled the run with it. 100% improvement. There are no longer puddles of muck and standing water, in the winter there is no dust. I agree that it is cold in the winter but when you live in Florida it's really not a big deal. I use wood shavings inside their coop. My girls are happy and healthy, they dust bathe in it, it's so easy to keep clean. I can't say enough about how happy I am. If I had the absolute perfect scenario it would be to have them on fresh grass every day, like a chicken tractor but because that's not an option on my tiny little yard, this is the next best thing. Thanks for your observations. Living in FL you obviously don't need to worry so much about the insulation factors. But glad you use shavings in the coop. Oh and as for disagreeing that's fine but scientific facts are facts and there's no way for you to gauge the levels of pathogens being harbored in your run area. I just heard of your blog and book from Holly. Cute blog! I have chickens too. I feed them a lot from the garden. They are all well. Glad you're writing about chickens, herbs and good food. Oh wonderful! Yes, we do things as naturally as possible and love our fresh eggs. Welcome. True it won't be as deep as a beach, but I trust experts' advice and am steering clear. I tried using sand in my brooder/coop--what a mess! 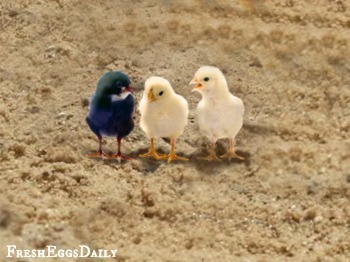 The chicks couldn't walk very well and when I tried to sift it to clean it, the chick poop became a cloud of poop dust! I immediately dumped it out and return to flake. I like being able to muck the whole thing out and replace it with new--I have a small coop and a small run and I need it to be clean as a pin for their health and my neighbors' noses! My land here in the Sandhills of NC is ....mostly sand mixed with clay deposits, we have drainage or muck. After the wet winter and the hens decimating the grass in the run I scraped it out but sand or dirt, removing the hay or straw, once saturated, the poop is there to stay. I use Aspen shavings in the coup, Aspen and hay in nest boxes because many old timers say straw is hollow and harbors mites and other bad vermin. I feel it would have to be changed often to be safe which is not cost or time effective and my hens rarely need their nests changed, I sometimes add a little to cushion eggs. I no longer use De in their coop as I use deep litter yearround and believe it kills bad and good alike. We have no smell nor flies, I think because their food is fermented, biggest problem winter and summer is coop is too dry, slowing down composting action, so I sprinkle with water now and again! I've heard of the PDZ, people around here use it in their horse stalls. I've never tried it since I have no problem with using straw in the coop. No odors, no mold or bugs or anything. I'll read these articles tho for sure. Thanks! I would imagine they do preen and bath more in sand vs shavings. But we have dirt in the run where they preen. I suppose IF they are confined to the coop 24/7 the sand would encourage more dust bathing. I wonder if those scientific studies have controls or if the are just testing sand and shavings. You have to watch out for the studies that are biased,and many of them are. There are many factors to consider such as the type of sand used. There are so many different types of sand in this world and they all have different nuances attached to them, it is astounding! To say all sand is alike will send many a sand researcher's palm to their face. Good article Lisa, and I agree with you. Incidentally, I went on the Chicken Chick's website and told her how irresponsible she was for highly recommending this medium for runs and coops without doing enough research as to the cons and she blocked me from commenting. Nice huh? I've always felt that if you are going to give advice, then you had better be able to take criticism with the praise. Keep up the good work. Agreed that studies are nearly always biased but I did my research on this one and would never use sand in the coop or brooder. I just find it incredible that one blogger would recommend something that is really not the best choice, for so many reasons. And to block you because you disagree? If you read the comments here, some disagree with me and I respect their choice. I always welcome respectful disagreement - but you found out that not all do....and thank you for your kind comments. Set up some roosts in your run, put in stumps or logs so they can get up off the mud. Agreed Sweet PDZ is a good product. Yes- I agree and our chickens love their sand dust bath as well - but in the entire coop and run. No way. Not something I would ever do. BokBok, I feel your pain. Even though I live in sunny So.Cal. when it rains here, my dirt run can get pretty mucky. My temporary solution is to at least throw down a good layer of straw to get them out of the muck. But for a long term solution then I need to do some serious drainage work. I need to but in French drains around the run to handle the down pour itself and the runoff from the covered run. My coop and run are also right next to a neighbors garage, so my hens get the run off from that roof as well! To handle that, I'm putting in a gutter to divert that water behind her garage. I have also read that others have extended the roof of their covered runs to create awnings to prevent too much water from reaching the run, and others have put roll-up tarps on the sides of their runs (like canvas tents have), that once let down, prevent wind driven rain from soaking their birds and making mud. I may be doing that as well. I hope that helps give you some ideas to rid yourself of the muck issue. In the run we do now put down handfuls of that bio-dry powder, lots of wood shavings and a little straw on top. If we get a lot of rain it still gets soaked - although it's not as muddy now, it's still not ideal in bad weather, even with a few weatherproof covers over the top and on the worst hit side. However, when it doesn't rain they absolutely love it and spend lots of time scratching around and wiggling their bums into it for a Nice Long Sit. The walk in run extension was a big hit too, covered or not - I saw a couple of the girls out there having a scratch around, even when it was snowing! Good luck with your awning/guttering projects! Because of the weather here in Upstate NY, I had to lock my girls up in their coop/run for a day, instead of having them free range like usual. I read on the Chicken Chick site that sand was a good choice in the run, before I discovered Fresh Eggs Daily. My hen passed away Sunday from a crop impaction, it was full of sand. Even tho it's going to be bitter here, I have a sheltered play pen for them to peck around in, in my garden, I am hoping no more of my hens succumb to this. I worked on massaging her crop and trying to dissolve it with warm water, all day on Sunday. I can't wait to scrape every last bit of that sand out of their run! I will never be convinced that sand is a good choice. The main chicken keeper who uses it has MG in her flock and lost many to all kinds of weird diseases.....that alone is evidence enough for me to steer clear. I have never had any issue with straw. And I live in a warm, humid environment. It's all about litter management. And bottom line, when you finally do clean out your coop, what the HECK do you do with a pile of poop-infested sand? Compost pile? I think not. Sand is the best soil amendment for clay soil. I live a the beach...sand sand EVERYWHERE..? There are a lot of chicken keepers here who don't put anything down. Sand drains well (my driveway can flood a good 2" inches of rain and it will be completely gone and half the time dry within 10 minutes of it raining). It does not get real hot here, and I've never felt it too hot to walk on. While we've never had chickens, our chicks are in the incubator right now and will be ours as soon as hey hatch. The people we're getting them from have always had good luck with them just strolling around their 'yard'. I get that sand can be dusty and could cause respiratory problems but unlike other bedding material, it doesn't retain the moisture. Of you four expert references, one is a chicken forum. It's an opinion. The NIH reference is about air pollution and not specifically about sand, The other two scientific references both refer to the same single old article that refers to human and water fowl waste in one particular place in Lake Superior. It states that less the 1% of the e coli found was pathogenic and that the wave action contributed to the e coli expansion. That's far from a convincing reason to not keep it in your backyard chicken run. If you know local old time chicken keepers that tell you to stay away from it, that's probably good advice, but again not necessarily applicable to everyone and in no way scientific. I think your speculations are crap sand helps my chicken stay out of the mud haven't had the one pass away since I started using sand. Straw and grass are the worst smelling and rotts when wet so sand is the way to go. I don't need a dc or scientist to understand that one. ... ... ... Why they came up with "play sand" or "sandbox sand" tho it eludes me why kids can't use beach sand in the sand box when they aren't worried about it at the beach? Anyway, all of that is understandable vis a vis Chickens and sand in runs, yada yada. I liked the article, glad I read it, will file for later use, as I am still a BYC Virgin. I always thought I'd let 'em play on average backyard gound, put out scratch/grit, and clean out all the ca-ca at least once a week. Reading this article has me thinking keeping sand out of the equation is the way to go. Same here. We switched to construction sand a couple of years ago and have had no problems. We live in an area that ranges in the 30's, at night in the Winter, to the 90's to 100's during the day in the Summer. We have no enclosed coops, anymore, but open air runs and pens, with roofs overhead, for shade, from rain and sun. I would never return to just dirt or stinking straw. And, for all intents and purposes, chickens are originally from a "jungle" bird and how many of us live in a jungle type environment? I believe chickens are quite capable of adjusting to most environments, if common sense by their owners, is used. I don't find our sand to be dusty, like straw, etc or even dirt. My soil is black volcanic sand, so when I compost the chicken manure of course the sand goes into the compost pile. It's just going to be mixed back into my sandy garden soil anyway, so what's the difference? Many years ago I went with sand in my main chicken runs because that's just what we have for dirt. I would never put it inside my coop or brooder though. Anyway, it has worked out beautifully in the runs for years. We live in a very damp, temperate climate. Sand prevents pooling water where pathogens breed in the nasty poopwater. I keep longtails like phoenix and sumatras. Keeping them on sand keeps their tail feathers clean instead of sodden and caked with droppings. Droppings in the runs are raked out weekly and the sand agitated so it has a chance to aerate. The other thing I LOVE about sand is I can take a weed flame torch and go over the sand any time I want to sterilize their runs. Heat is the only reliable way to kill coccidia without having to dump super toxic Oo-cide on everything. Any substrate is going to breed disease if it isn't maintained properly. Sand just has different requirements than others, and it's not going to be ideal in every case. The fact that I can basically sterilize their areas with a flame thrower is pretty awesome, because there are zero pathogens or parasites who can survive that. The only birds I have lost were early on to raccoon predation before closing some security loopholes.